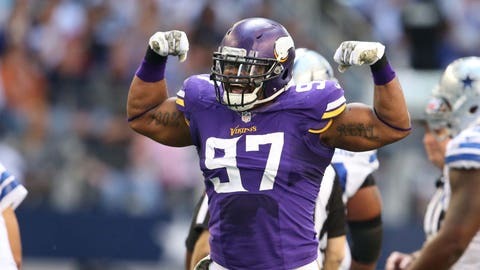 Vikings DE Everson Griffen (illness) was declared inactive just before game time. The Minnesota Vikings did not have defensive end Everson Griffen, the team’s leading sacker, during their 16-10 win over the Kansas City Chiefs in Week 6. Griffen was not on the injury report all week, but he was inactive with an undisclosed illness on Sunday. Griffen’s replacement, third-round rookie Danielle Hunter, did not know he would get the starting nod until just before game time. "It was pregame when I found out," Hunter said, per The Sports Xchange. "We practiced all week and we always have to be ready for the game. Coach preaches to us about always being ready to be the next man up." As of Monday, the NFL was expected to check in with the Vikings to ask why Griffen was inactive after not being mentioned on the injury report, according to The Sports Xchange. Zimmer didn’t seem all that concerned about the league’s inquiry. "All I know is he was sick on Sunday morning because I saw him," Zimmer said. The Vikings need Griffen to make a speedy recovery. He can add to his sack total (3.0 in 2015) against quarterback Matthew Stafford and the Detroit Lions in Week 7.